Report RSS	Nominate ZPS for: The "Test of Time" Award + Twitch Channel! During the Steam Autum Sale, everyone has been given the chance to nominate their favorite games for various awards. We're currently working hard on the v3.0 build and we are hoping to breathe new life into the game and bringing in old as well as new players and communities, and for that to happen we need your help; We need to spread the word! During the Steam Autum Sale, everyone has been given the chance to nominate their favorite games for various awards. We're currently working hard on the v3.0 build and we are hoping to breathe new life into the game and bringing in old as well as new players and communities, and for that to happen we need your help; We need to spread the word! You have already shown a tremendous support for the new update, and we are thankful for the excitement and dedication that so many of you display. 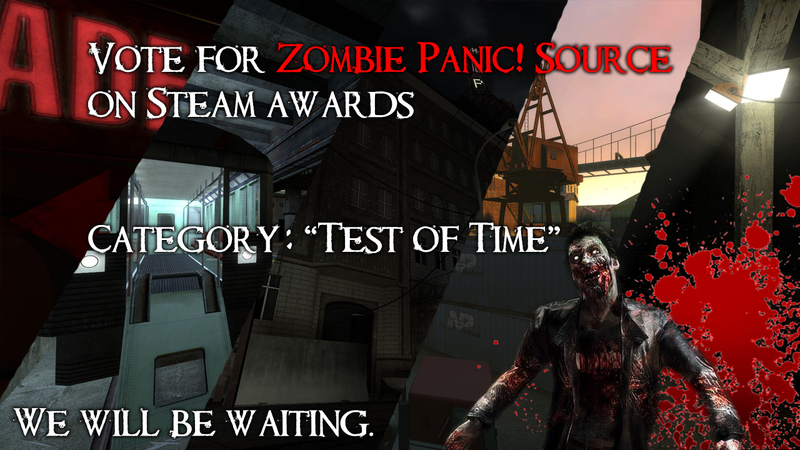 These awards are a great way for the game to gain more recognition – and we’d love for you guys to nominate Zombie Panic! Source for The Test of Time Award! This is awarded to the game that has not only remained a blast to play throughout its’ history, but also the game with a community that is dedicated and involved. We believe ZP!S is that kind of game, and for that reason we’re asking all of you to help support us in nominating the game for this award. We’ve done our best to engage with the community for ideas and feedback, give insight into the development through sneak peaks and, starting tomorrow, Friday, November 25th, 9 PM EST, weekly mapping development streams. Casei Magnus will be sharing his mapping work on upcoming - and experimental maps and designs, where you can give feedback, share ideas and have a good time while discussing ZPS - all to make sure that the new update ends up being what both our development team and community want. The new update is coming. We have begun the playtesting phase where we make sure that everything is running as it should and that no bugs or exploits make it through to the launch. After the playtesting phase has completed, what will remain on our to-do list before the build is ready for launch is the Linux port and stress testing and hardening of the game’s netcode. Stay tuned and share the news with your friends!